The people that run The Internet have been clamoring for years for increased adoption of IPv6, the next generation Internet Protocol. Modern operating systems, such as Windows 8 and Mac OS X, come out of the box ready and willing to use IPv6, but most networks still have only IPv4. This is a problem because the administrators of those networks may not be expecting any IPv6 activity and only have IPv4 monitoring and defenses in place. In 2011, Alec Waters wrote a guide on how to take advantage of the fact that Windows Vista and Windows 7 were ‘out of the box’ configured to support IPv6. Dubbed the “SLAAC Attack”, his guide described how to set up a host that advertised itself as an IPv6 router, so that Windows clients would prefer to send their requests to this IPv6 host router first, which would then resend the requests along to the legitimate IPv4 router on their behalf. This past winter, we at Neohapsis Labs tried to recreate the SLAAC Attack to test it against Windows 8 and make it easy to deploy during our own penetration tests. We came up with a set of standard packages and accompanying configuration files that worked, then created a script to automate this process, which we call “Sudden Six.” It can quickly create an IPv6 overlay network and the intermediate translation to IPv4 with little more than a base Ubuntu Linux or Kali Linux installation, an available IPv4 address on the target network, and about a minute or so to download and install the packages. As with the SLAAC Attack described by Waters, this works against networks that only have IPv4 connectivity and do not have IPv6 infrastructure and defenses deployed. The attack establishes a transparent IPv6 network on top of the IPv4 infrastructure. Attackers may take advantage of Operating Systems that prefer IPv6 traffic to force those hosts to route their traffic over our IPv6 infrastructure so they can intercept and modify that communication. To boil it down, attackers can conceivably (and fairly easily) weaponize an attack on our systems simply by leveraging this vulnerability. They could pretend to be an IPv6 router on your network and see all your web traffic, including data being sent to and from your machine. Even more lethal, the attacker could modify web pages to launch client-side attacks, meaning they could create fake websites that look like the ones you are trying to access, but send all data you enter back to the attacker (such as your username and password or credit card number). As an example, we can imagine this type of attack being used to snoop on web traffic from employees browsing web sites. 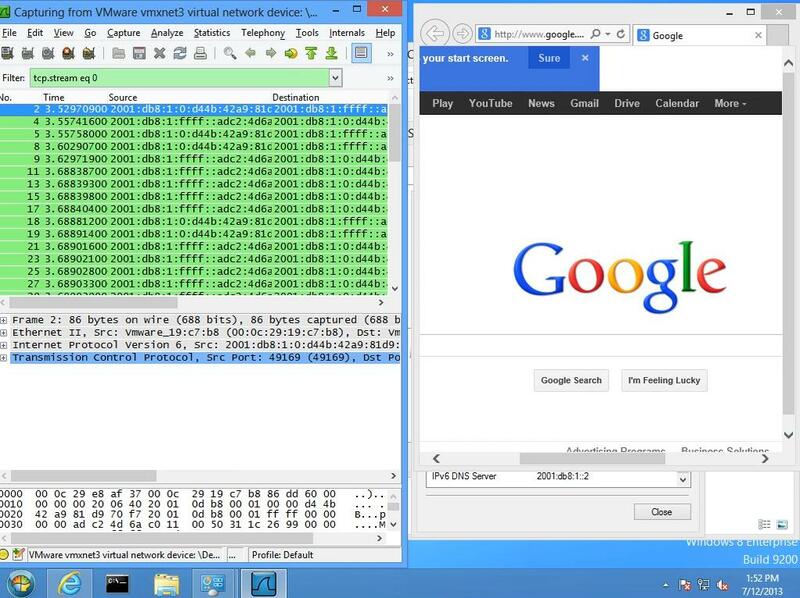 Even more lethal, the attackers could modify web pages to launch client-side attacks. The most extreme way to mitigate the attack is to disable IPv6 on client machines. In Windows, this can be accomplished manually in each Network Adapter Properties panel or with GPO. Unfortunately, this would hinder IPv6 adoption. Instead, we would like to see more IPv6 networks being deployed, along with the defenses described in RFC 6105 and the Cisco First Hop Security Implementation Guide. This includes using features such as RA Guard, which allows administrators to configure a trusted switch port that will accept IPv6 Router Advertisement packets, indicating the legitimate IPv6 router. At DEF CON 21, Brent Bandelgar and Scott Behrens will be presenting this attack as well as recommendations on how to protect your environment. You can find a more detailed abstract of our talk here. The talk will be held during Track 2 on Friday at 2 pm. In addition, on Friday we will be releasing the tool on the Neohapsis Github page.